The foundation, woodwork, wiring, insulation and ducting in the attic and crawl spaces are gourmet food for the pests, microbes and small animals hiding away in these dark and dingy areas. They set up base in these regions and have a party as they nibble away at your precious belongings and stacked goods. These living creatures are harmful and can cause serious health issues to the residents of the home and need to be removed at the earliest. You need to shield your treasured memories and stay healthy. Just call us at Quartz Solutions, and we can help you here by scheduling a free inspection right away. The crawl space is sometimes detected with a dangerous gas called Radon, which has carcinogenic properties and needs to be removed right away. Menacing and threatening insects like ants, termites, cockroaches, yellow jackets, yellow ants, spiders, fleas, and spiders hideaway in the attic and crawl spaces and they gobble away at the woodwork, wiring, ducting and insulation to appease their hunger. The ducting that has been damaged by the hungry animals start to leak and drip. The dripping ducts increase the humidity level in the house and the temperature variation indoors becomes a cause of concern, because of the ruined insulation. There is no option but to consume extra energy thus leaving the person with an inflated power bill in hand. Small animals like rats, mice, squirrels and rodents defecate and urinate in the attic and crawl spaces contaminating the whole area, making it a power house of diseases and infections. Mold and mildew starts to grow because of the humid environment and this starts to destroy the foundation and woodwork of the home. 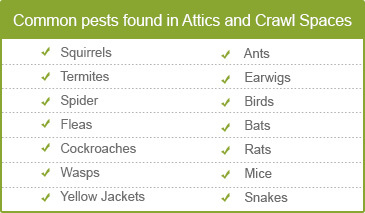 Infestation in your attic and crawl spaces? People have no idea that certain parts of these homes that have been neglected are a haven for frightening and creepy bugs. There are many creatures lurking in your attic and crawl spaces unknown to you. We, at Quartz Solutions employ skilled teams that can immediately get their latest equipment into your attic and crawl spaces to carefully scrutinize where the small animals and pests are hiding absolutely “free of charge”. The cleaning process needs to be carried out for health reasons and the process doesn’t stop here. If the area remains neglected, it will once again face the attack of these creatures. For this you have to keep a constant eye on your attic and crawl spaces which is not an easy job. Why don’t you hand over the responsibility to us? All you have to do is enrol for an upkeep plan with us. 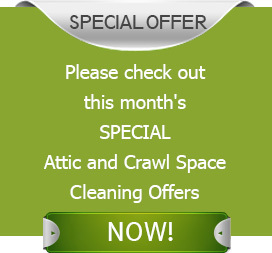 The best priced packages for attic and crawl spaces are specially prepared by our teams at Quartz Solutions and this is done because the cleaning services respect the money earned by their valued customers. You just have to begin the cleaning process by availing our free inspection scheme, right away! Wayne is situated about 20 miles off midtown New York and provides a suburban balanced community for the residents to live in. Museums, entertainment centres, recreational facilities, all make living in Wayne, excellent and exceptional. Quartz Solutions takes up the cleaning and upkeep of attic and crawl spaces for the residents of Wayne and promises them a free inspection at the earliest. We have maintenance and up keep services chalked out so contact us at 973-536-1013 right away. A terrible stench was giving us sleepless nights. After a brief search I called Quartz Solutions. Josh came the next morning for inspection and traced it to rodent infestation. He removed the remains and dropping, cleaned and disinfected the area. They sealed entry points to correct the issue.